Phowa, or ‘transference of consciousness at the time of death’ is the simplest and most direct method to attain enlightenment. It is one of the six Yogas of Naropa. There are many marvelous fascinating phowa instructions, in different tantra texts of new and old lineages. However, the Drikung phowa lineage, whose Tibetan name "Jaktshugma" means "the standing grass blade," is one of the most powerful and precious phowa practices still taught today. Phowa Jagtsugma instructions of transfer to the pure land of Dewachen is included in the terma of ancient secret mantra lineage, which was rediscovered, and propagated a few hundred years later, and are presently upheld in an unbroken lineage through the Drikung masters. The Drikung order is famous for its ability to successfully transfer the power of the phowa meditation to initiated and devoted practitioners who practice it. Thus, the Phowa transmission given by the Drikung lamas came to be known as the 'Drikung Phowa Chenmo' - the Great Drikung Phowa. In Tibet, the famous Drikung phowa became so powerful that it became a tradition to have a Drikung Phowa Chenmo ceremony every twelve years at Dro-ngor Sum-dho at Drikung in central Tibet by the two head lamas of the Drikung lineage. The phowa Jaktsugma (the standing blade of grass) lineage is one of the precious phowa practices. In the eighth century, the Dharma King of Tibet, Chogyal Thri-song Deu-Tsen invited the great Indian tantric master, Guru Padmasambhava, to Tibet and they successfully built the Samye monastry. Guru Padmasambhava ripened the minds of the king and his subjects through the vajrayana vehicle. During that time, Guru Padmasambhava was residing in Chimphu cave in the vicinity of Samye when an important minister of the King, Nyima, had a great tragedy. He had great wealth and power. He had two palaces and was bringing many things in and out of storage. He was doing this by a light of lantern, when a small spark caused a fire which instantly burned down the entire palace, tragically killing thirteen people including his parents. All his horses, mules, cattle and other animals also perished in the fire. Minister Nyima, thinking of the respect and honor that others show their parents, felt that he had committed the heaviest of sins by causing the deaths of his parents and others. He was tortured with the suffering. The king, desiring to end the suffering of his minister, went to Chim-phu cave to request the help of Padmasambhava. Padmasambhava, by miraculous power went to the Pure Land of Dewachen to see Amitabha Buddha. He told Amitabha Buddha about the suffering of minister Nyima and of all sentient beings. He asked Amitabha Buddha to give a special teaching to free all from suffering. Amitabha Buddha gave this Phowa teaching to Padmasambhava and instructed that it should only be given to Minister Nyima for the time being, and sealed so it should not be given to others. Padmasambhava through miraculous power then come back to Chim-Phu cave in Samye and gave this teaching to minister Nyima who then gave up all worldly activities to practice phowa. He achieved the signs and realization of phowa. Through the path of phowa, minister Nyima’s consciousness attained the Pure Land of Dewachen. At the time of death, he used the phowa,and inconceivable marvelous signs appeared, such as rainbows in the sky and relics from the body. Then this text was written on the palm leaf with the blood from the ring finger of Padmasambhava as the ink and the hair of Yeshe Sogyal as the pen. It was sealed seven times and wrapped with waterproof silk and so forth. Then it was hidden under the Black Mandala Lake which is located behind the East Dhag-Iha-gampo Hill. The Naga king, Tsurana-Ratna, asked to be guardian of this text. He was told by Padmasambhava that the future incarnation of minister Nyima wouldbe Nyida Sang-gye and that he must give the text to him. Padmasambhava then left to go to the land of the Rakshas in the southwest. After more than 350 years, the incarnation of minister Nyima was born as the son of a shepherd and given the name Nyida Sang-gye. While Nyida Sang-gye was growing up, he looked after the sheep, during which time he felt great compassion and wept tears of sorrow when the lambs and the other animals would die. Amitabha Buddha appeared directed to him and said” Oh Son of a noble family, don’t suffer. This is the profound teaching to alleviate your suffering and to benefit all sentient beings.” Thus he gave this Phowa teaching. Nyida Sang-gye then gave the Phowa to all the dying animals and often many miraculous signs appeared, such as rainbows and lights during the day. The Naga King then came to Nyida San-gye and told him of the Hidden Text (Terma). 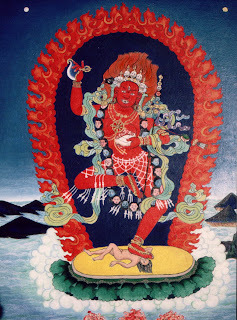 Nyida Sang-gye took the Ter from the Black Mandala Lake and first gave the teaching to the Nagas in the lake. Through this teaching, most of the Nagas were liberated from the lower realms and reborn into the temporary high- goodness realms. After that, this teaching was given to many human beings and they were established in liberation. This great knowledge-holder terton gave the lineage transmission to Nam-kha Gyaltshen, the great being, the keeper of this teaching. He gave it to the great realized Sangha Bhadra. He was not able to find a teacher to hold this lineage. He then received a prophesy from Vajrayogini to give the transmission to Ra Dzi Trime Lodro( Phago Trime Lodro) in Phan Po. He gave him this transmission. He matured and liberated thousands of disciples through this phowa. Then he transmitted the lineage to Cho-je Sang-Gye Gyaltshen of Dsing Ta Tak To. Then he transmitted this to Lopon Gyaltshen of Man-tse. He transmitted this lineage to Lho-drak Phuntsok Namgyal, the abbot of Yang Gri Gar monastry. He gave the lineage to Kunchog Ratna, the fully enlightened one, the first Drikung Kyabgon Chetsang and the great Vidyadhara Dharmakirti (Chokyi Dragpa), the first Drikung Kyabgon Chungtsang. These two great beings enriched these profound teachings and made them well-known. Since then this great Phowa teaching has become one of the profound teachings of the Drikung Kagyu Lineage. 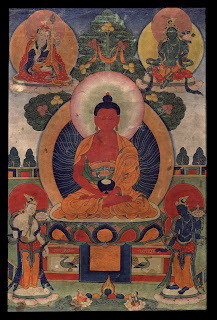 As explained in the sutra and tantra, the qualified disciples, with no doubt or hesitation about the lama or the teachings, experience the phowa signs, such as opening the Brahma door, becoming unconscious, and so forth, simply by receiving the ‘lung’ blessing transmission without even depending on the practice. The signs of this phowa are experienced by many people and it is quicker than other phowas. Because of this, the fame of the magnificent blessing of this great Drikung phowa remains intact and not exaggerated. These two brothers gave the lineage to Lama Lhopa Tulku Trinley Namgyal, and so forth. The lineage was transmitted to the present time. This is the brief account of the history of the teachings.